Matt Bouldin, a supporting actor his first three seasons at Gonzaga, was excited about taking over the lead role when the Bulldogs gathered last fall for their first workouts. Bouldin’s excitement quickly waned after he watched his young teammates struggle mightily in the first few practices. “I remember calling my dad: ‘Dad, this could be a long year,’” Bouldin recalls. It turns out that Bouldin is a better basketball player than clairvoyant. The legion of young, inexperienced players on the roster won over Bouldin with their hard work and (eventually) quality play, and now the Bulldogs find themselves making their 12th straight trip to the NCAA tournament. “This has been the most fun I’ve had in my four years [at Gonzaga],” Bouldin says. Bouldin’s sunny outlook is understandable. The Bulldogs are 26-6, won the West Coast Conference regular-season championship for the 10th straight year and stand 18th and 22nd in the two major polls. “I don’t think I’ve ever been as proud of a group as this one,” coach Mark Few said. Few’s pride and joy takes on Florida State (22-9) on Friday at HSBC Arena in Buffalo, N.Y. The winner of that first-round game likely would face fourth-ranked Syracuse (28-4) on Sunday in Buffalo. The Orangemen are seeded No. 1 in the West Region and open against 16th seed Vermont (25-9). Unranked Florida State, seeded ninth in the West, finished third in the tough-as-nails Atlantic Coast Conference. The Seminoles often struggle to score and avoid turnovers, but they have the nation’s stingiest defense. Opponents shoot less than 38 percent against them. “They’re a phenomenal defensive team,” Few says. The eighth-seeded Bulldogs aren’t the offensive juggernaut of past years, but they rank sixth nationally in field-goal shooting, making almost half their shots. Gonzaga ranks 26th in scoring with nearly 80 points per game. Bouldin, the WCC Player of the Year, leads a balanced attack. Four Bulldogs average 10 points a game or more. Solomon Alabi, a 7-foot-1, 251-pound center from Nigeria, leads Florida State with nearly 12 points a game. ACC Defensive Player of the Year Chris Singleton, a 6-9, 227-pound forward, averages 10 points and 7 rebounds per game. Both are sophomores, as is Gonzaga’s 7-foot, 247-pound center, Robert Sacre. Gonzaga vs. Florida State on Friday, March 19, at 4:10 pm in Buffalo. KREM 2, KGA 1510 and KEYF 101.1 will broadcast the game. The North Carolina Tar Heels have a storied tradition in women’s basketball. The Gonzaga Bulldogs … not so much. Vivian Frieson makes no apologies for paying little heed to history. All Frieson knows is that the Bulldogs are intent on making history now, and Frieson views the Tar Heels as nothing more than the next hurdle in Gonzaga’s path to glory. “Whatever they bring, we’ll be ready for. I just hope they’re ready for us — that’s the big thing,” Frieson said after the Zags drew North Carolina in the first round of the NCAA tournament Saturday night in Seattle. Frieson, one of three All-West Coast Conference players on the Bulldogs, has good reason to be confident. Gonzaga is 27-4, ranked 14th and riding an 18-game winning streak. “Our goal is to get to the Elite Eight and hopefully deeper,” Frieson says. The unranked Tar Heels have lost eight of 11 games to slip to 19-11. In a slap in the face to their legacy, the Tar Heels tied for seventh in the Atlantic Coast Conference. The ACC, however, is a big step up from the WCC, which Gonzaga dominated like never before with an endless series of blowouts. Some coaches have tabbed Gonzaga the best team in conference history, but outsiders might question how the Bulldogs will handle the pressure of a tight game -- not to mention North Carolina’s pressure defense. Frieson, a senior forward, points out that the Bulldogs have “an amazing point guard” in junior Courtney Vandersloot. The two-time WCC Player of the Year, Vandersloot averages 14.6 points, leads the nation with 9.3 assists and ranks sixth with 3.5 steals. Vandersloot is the all-time WCC assists leader. Heather Bowman, a senior forward out of Spokane’s Lewis and Clark High, is the all-time WCC scoring leader. 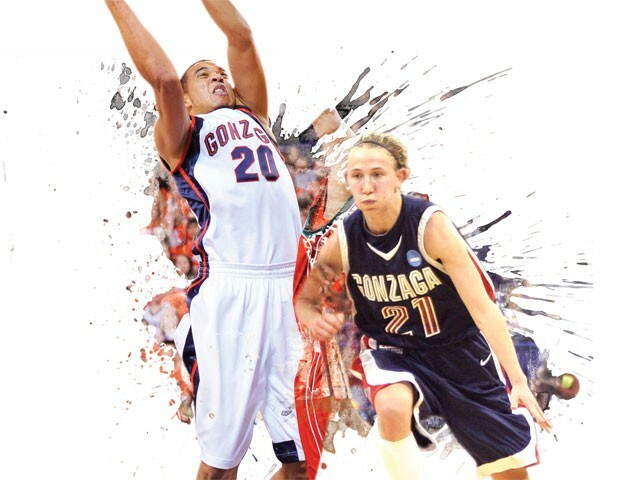 She leads Gonzaga with 15.6 points per game. North Carolina is led by junior Italee Lucas (14.8 ppg) and Cetera DeGraffenried (14.3 ppg). The Tar Heels are seeded 10th and Gonzaga seventh in the Sacramento Region. The winner plays Monday in Seattle against the winner of Saturday’s game between second-seeded Texas A&M (25-7) and 15th seed Portland State (18-14). Ninth-ranked A&M beat Gonzaga 80-76 at a December tournament in Las Vegas. Gonzaga vs. North Carolina on Saturday, March 20, at 7:30 pm at UW’s Bank of America Arena. ESPN2 and KEYF 1050 will broadcast the game. Eastern’s “reward” for earning an automatic bid into the Women’s National Invitation Tournament as a regular-season conference champion is a first-round game Thursday at Oregon. That would be the same Oregon team that crushed Eastern 86-48 in November. The Ducks have lost seven straight games, but Big Sky Conference teams like Eastern (19-11) rarely fare well against Pacific-10 Conference teams like Oregon (16-15). That’s particularly true when teams run, gun and press like the Ducks do under first-year coach Paul Westhead, a former NBA and WNBA head coach. Oregon ranks fourth in the nation with 81.4 points per game. Three Ducks average more points than Eastern scoring leader Julie Piper (12.0), the Big Sky’s Most Valuable Player. However, the Ducks rank 329th among 332 NCAA Division I teams in points allowed (77.2). A game time and broadcast information weren’t available at press time.